Who will still fail the residence test? Victims of torture from abroad where the UK Government is complicit. “Today I met a man who believed the UK Government was complicit in his torture. 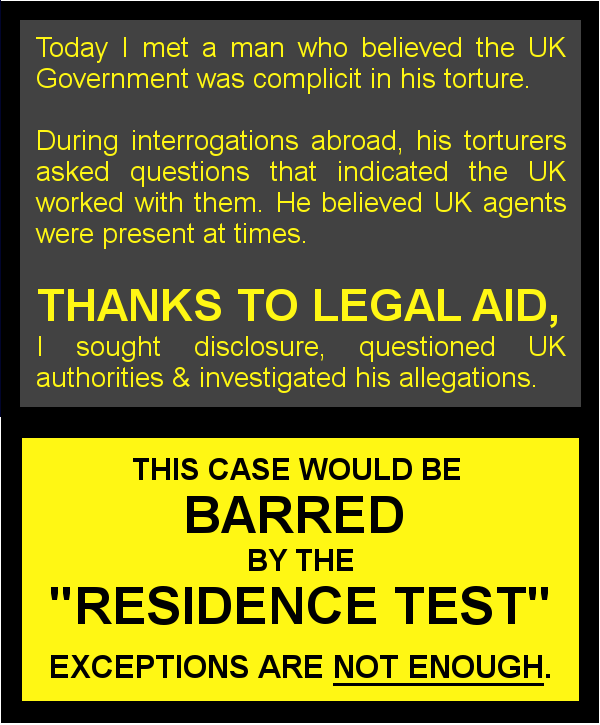 During interrogations abroad, his torturers asked questions that indicated the UK worked with them. He believed UK agents were present at times. THANKS TO LEGAL AID, I sought disclosure, questioned UK authorities & investigated his allegations. This entry was posted in Cases that will fail the residence test, Human rights law and tagged cuts to legal aid, Legal aid, save legal aid, save UK justice by thanks2legalaid. Bookmark the permalink.